Does Papaya Help Weight Loss? What Does a Probiotic Do? If you're trying to lose weight, you probably already know that you need to take in fewer calories each day than you expend. However, this is often easier said than done, making the many diet aids available on the market tempting. Neither papaya nor papaya enzyme does much to promote weight loss, however. To lose the kind of weight you want -- presumably, you wish to lose body fat -- you need to force your body to burn the fat for energy. The cells burn stored fat whenever the number of calories you take in each day is less than the number your cells require to maintain function and fuel your activities. The two best ways to lose weight are to eat fewer calories and to burn more through increased activity. 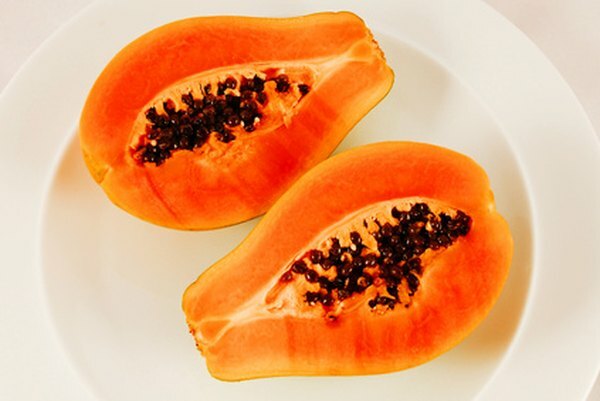 One of the common dietary aids rumored to help you lose weight is papaya. You might have heard that the fruit itself is helpful, or you may have heard that you should take papain, which is papaya enzyme, in supplement form. Neither papaya fruit nor papain can cause your cells to burn more fat, however. This is because papaya and papaya enzyme don't affect your metabolism, which is the rate at which your cells burn calories. Papaya enzyme is the most common reason some people think papaya makes a good dietary aid. Unfortunately, there's simply no scientific proof to support the idea that papaya enzyme burns fat. Papain is actually a proteolytic, meaning it digests protein. In your body, however, it doesn't appear to do anything. This is because your acidic stomach breaks down the sensitive enzyme and destroys it. Further, proteolytic enzymes have no ability to affect metabolism, according to Drs. Reginald Garrett and Charles Grisham in their book "Biochemistry." There is one indirect way in which papaya can help you lose weight. If you consume papaya instead of other, more calorically dense foods, you will take in fewer calories and will consequently burn fat to make up the deficit. Papaya is full of both water and fiber, which not only benefit your digestive health, says Dr. Lauralee Sherwood in her book "Human Physiology," but also help you feel full longer. Can You Lose Weight Drinking a Gallon of Water Every Day? Can Vitamins Make You Feel Bloated? Is Stretching After a Workout Important? Does Lemon Water Speed Your Metabolism?